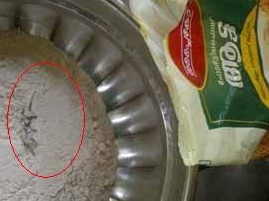 Alapuzha (Pathiyoor): Even after the government’s boast – all measures are being taken to ensure food safety in Kerala, a dead lizard was found in a supplyco’s Aatta packet that was delivered from the ration outlet. Ramaswamy residing at Pathiyoor East Kaanjiramparambil had to go through this bad occurrence. He founded the dead lizard while the packet was wrecked in the morning.